The Angel Oak is a Southern live oak tree located in Angel Oak Park, in Charleston, South Carolina, on Johns Island, one of South Carolina's Sea Islands. It is estimated to be in excess of 1400 years old, stand 65 ft (20 m) tall, measure 9 ft (2.7 m) in diameter, and shade with its crown an area of 17,000 square feet (1,600 m2). Its longest limb is 89 feet (27 m) in length. The tree and surrounding park have been owned by the city of Charleston since 1991. 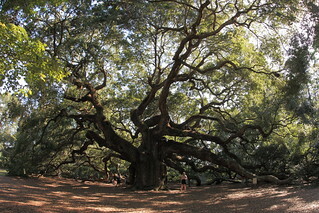 The Angel Oak is thought to be one of the oldest living organisms east of the Mississippi River. Angel Oak stands on part of Abraham Waight's 1717 land grant. The oak derives its name from the Angel estate, although local folklore told of stories of ghosts of former slaves would appear as angels around the tree. The tree has become a significant tourist attraction. It has survived countless hurricanes, floods, earthquakes, and human interference. 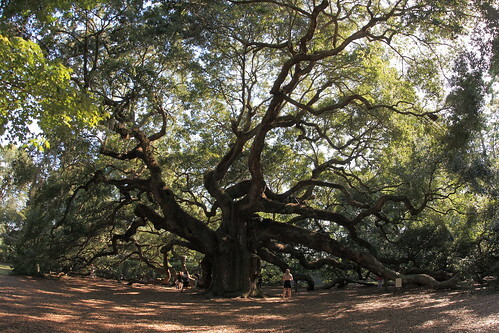 Angel Oak was damaged severely during Hurricane Hugo in 1989 but has since recovered. Acorns from the Angel Oak have grown to produce authentic direct-offspring trees. Live oaks generally remain short in proportion to their outward growth.